1. Love Beets- I have always been a big fan of beets but boy, are they messy to cook with! My favorite way to make beets myself is to cut them up and roast them. This always dyes my hands and cutting board purple for a few days. These Love Beets are the perfect solution. They are already peeled and cooked beets. They come in different flavors. I was sent the balsamic infused, honey and ginger infused, organic beets in vinegar and sweetfire infused. My favorite of these beets is the balsamic infused. 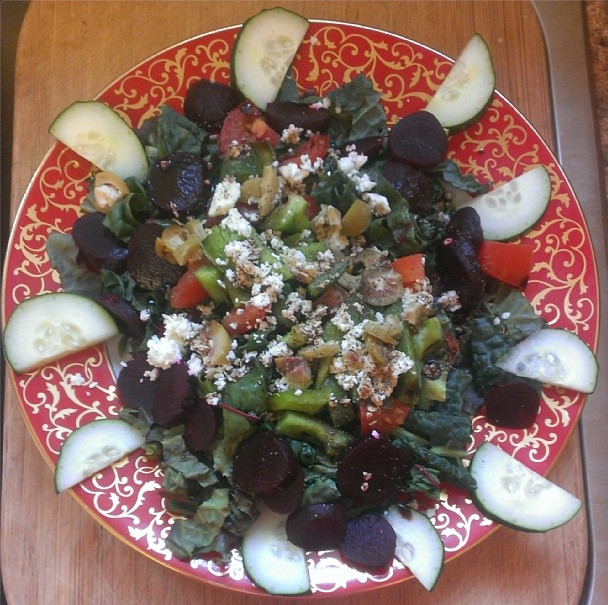 I cut a whole bunch of beets up over my Greek salad and loved them! They taste like pickled beets but fresher than the canned variety. I will be using these all week to top my salad. 2. 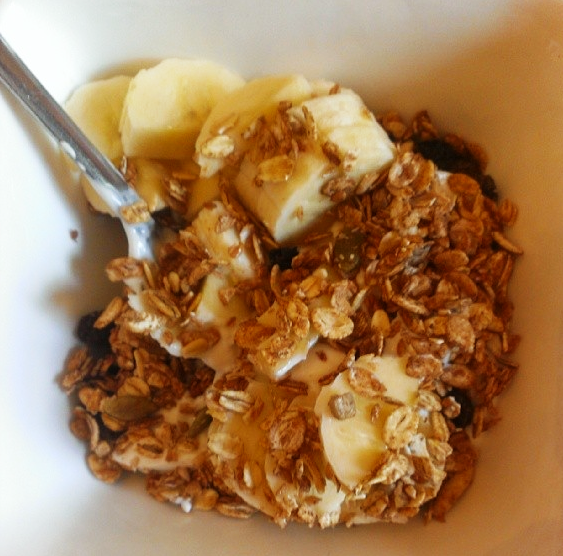 Siggi's Yogurt- I had tried Siggi's yogurt about 3-4 years ago and thought that it was just okay at the time. I thought that it was a bit too sour and bitter. My tastes for yogurt have changed and it is now my favorite yogurt. The flavors are so fresh and flavorful. I love the pomegranate and passion fruit flavor especially. The orange and ginger is unique and tasty and the strawberry goes well with granola. 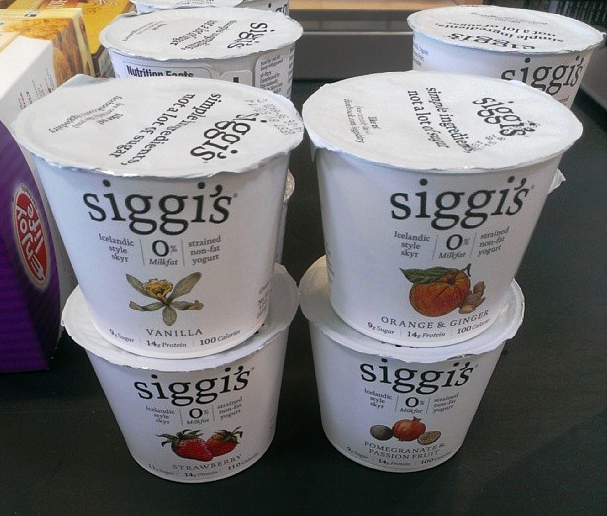 Siggi's is an Icelandic style skyr yogurt. Most of the their flavors are fat free but the coconut one contains 2% fat. The calories are very low in this yogurt with only 100-110 calories per yogurt. Each one has 14 grams of protein which is very similar to Greek yogurt. They are much lower in sugar than almost any yogurt out there. I have enjoyed eating one of these for part of my breakfast very much. They are super thick, very creamy and are tart. They are currently my favorite brand of yogurt as I am quite sick of the overly sweetened Greek yogurts available. If you have not tried these yet, you must pick up a couple in stores. 3. SELF Healthy Kitchen- This is a line of brand new non-GMO frozen meals that launched just this year in collaboration with SELF magazine. They were created with chef Calvin Harris who goes by the farm to freezer mentality. Meals feature super ingredients such as sweet potatoes, avocado, pumpkin seeds, quinoa and more. These meals can be found at Whole Foods. They contain no BHT, MSG, caramel coloring and more that many frozen meals do. The meals that I was sent are quite low in calories with 280-340 calories per meal. Options include three cheese lasagna, garlic chicken alfredo, grilled drunken chicken and southwest style chicken enchilada. I have enjoyed trying these meals a lot for when I am on the go. The three cheese lasagna is actually the lowest in calories and tastes indulgent. I also enjoyed the drunken chicken which comes with a cilantro-lime brown rice. These meals taste fresher than your typical frozen meal. My favorite part about these meals is that the sodium content is actually not too bad!!! Most frozen meals are extremely high in sodium and these have about 400-450 mg of sodium per meal. That is about half or less of the sodium content that you find in other frozen meals. In a pinch, I would definitely purchase meals from SELF Healthy Kitchen.